Here’s the thing. I think that sometimes, a person can be in a creative phase. That’s when the person derives joy from creating things and allowing others to enjoy them. But other times, a person is in a consumer phase. Rather than creating, joy comes from the things that others create. And the universe always needs a balance of creators and consumers, blah di blah existential hypotheses. All that to say that I am still enjoying a lot of things that I did not create and I want to tell you about them. Since the last My Favorite Things seemed to go over well, I thought I’d let you know about the things, the delicious consumery things, that I’ve been enjoying this month. So, presenting: My Favorite Things, October edition! I’ll share the recipe soon. Promise. Promise! I know, I’m mean. I’m sorry. But they are delicious. I realize this sounds super geeky and whatever but just in case you weren’t paying attention this year, they gave a prize for what I currently work on. Ok, it’s what a lot of people work on. Even Mr. P worked on G-protein coupled receptors when he was in grad school. 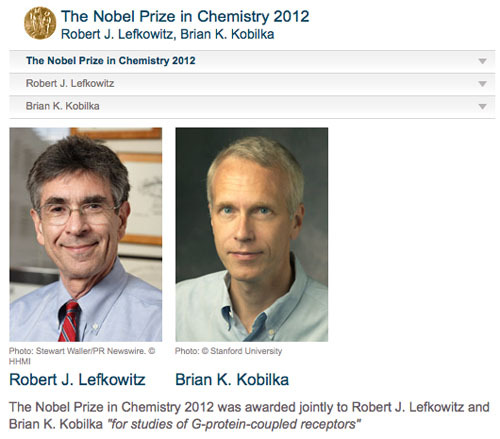 They’re kind of a big deal (which is why their work won the Nobel Prize, duh). Still, I’m pumped that something I work on won a Nobel Prize because hello, funding agencies! Would you like to give me some money to do Nobel-worthy research? Despite what the general public envisions about scientists, I actually spend a lot of time doing really mindless stuff at work – important, but mindless. And it’s during those tasks that I listen to podcasts and audiobooks. When I needed a new audiobook this month, Mr. P (well, his online buddies) suggested Gone Girl, which has been pretty hot lately. The husband and wife in the book are downright crazy at times, but I actually found a lot of the characters to be bizarrely relatable just because they’re well written. Also, much of the book takes place in St. Louis and the surrounding areas, which was an extra relatability bonus. If you’re looking for a new book to read – a thriller that is much more beach-reading-ish than last month’s Cloud Atlas – give this one a try. That is, if you’re willing to let a story make you feel topsy-turvy and oddly unsettled... perfect for Halloween, maybe? Another bit of audio entertainment, perfect for those long stretches of time sorting fish larvae on the microscope. If you follow cooking blogs, you’ve probably at least heard of Joy the Baker. But like me, you may not have realized that she also has a delightful podcast! I found it recently after bemoaning my latest podcast rut, and really, I’m in love. Though honestly I’m a bit surprised I’m in love, as Joy and her co-host Tracy can be girly and giggly and goofy, which not necessarily things I look for in a podcast. But turns out if you give them a chance, they are dreamy and addictive! Give them a listen, why doncha? When we moved to St. Louis, I was all pumped because I’d finally be able to buy wine in grocery store. Specifically, I’d be able to buy Two (now Three) Buck Chuck, a.k.a. Charles Shaw wine at Trader Joe’s. So I got a bottle of good ol’ Chuck and... yeah. It’s okay, I guess, but among the notes of fruit and oak, there’s a definite tang of “this cost less than three dollars”. Our local Italian market sells Tisdale for $3.50 and dang, Gina it is a tasty cheap wine. I’ve served the Pinot Grigio to family and friends and it is totally, definitely, my go-to table wine. Their webpage may be busted most of the time (as I found out tonight), but hey, if the wine is quality, who cares. If you can get your hands on it, it should be your go-to table wine, too! That’s right. It’s official: I have joined the ranks of the shiny touchscreen doodads. A gift from Mr. P for our dating anniversary. The back has my name engraved with the date 10-11-12. I know, awww. I was equally enamored because he bought the red color specifically because a portion of the sales goes to charity to combat AIDS and, well, he knows I like charity stuff. Why an iPod touch? Well, I am still too stodgy and old-school to have an iPhone (the data plan! it is so expensive! also I hate the phone!) but having wifi in my pocket around campus is pretty great. Plus I was in the market for a point-and-shoot camera, so this was two devices in one. I love it, love it, love it. I guess if you’re already hooked on the smartphone crack, an iPod touch is not for you. But it’s perfect for me, and I’m pretty sure it’ll revolutionize the way I blog. 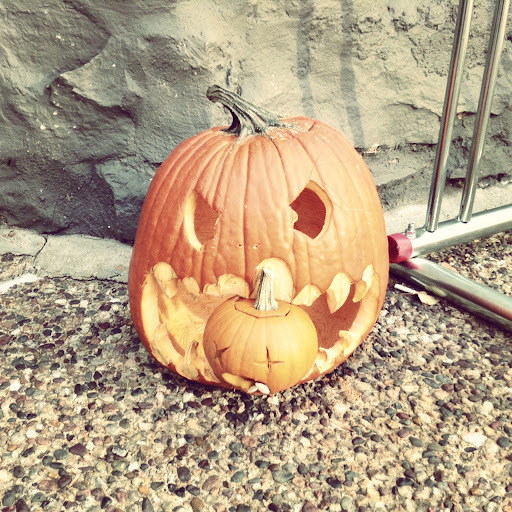 For instance, that pumpkin photo up there was taken with Instagram because, oh my gosh, I Instagram now. What the heck. I’m sure I’ll have other favorite apps to discuss soon, once I’ve figured out how to be a productive member of the shiny touchscreen army. What did you consume in October? Or create because hey, we need those people too? Any endorsements of your own? First, I love the red IPod. 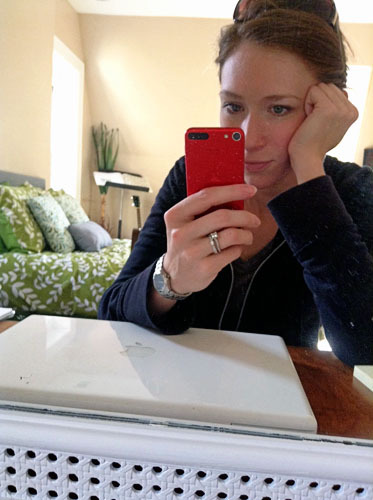 I am an IPhone girl (I use it every morning to read your blog while I sip coffee and sort through my email at work) but my heart still skipped a beat at your pretty IPod. :-) Will you share your Instagram name? I would love to follow you! And thanks for the Pinot suggestion! I love wine but since my husband doesn't drink it (sad, I know) I usually won't spend the money to get a bottle. However, I can easily justify $4 for some tasty wine! And finally, my short October favorite thing list -- warm sweaters, scarves, all this pumpkins (I've made pumpkin muffins & scones from Pinterest), fall mani and pedis, and finally, cozy socks from Old Navy. I love today's and yesterday's posts! And Mike's Bikes pumpkins plainly speak to my sense of humor - definitely pinning that pic... I would so be doing that one if today wasn't Halloween itself.